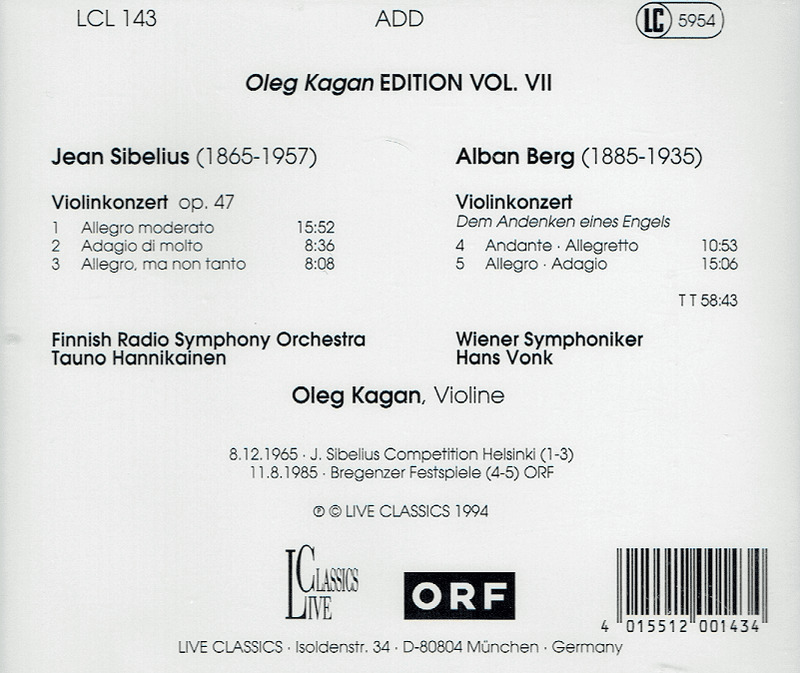 “Oleg Kagan is not to be confused with that other Russian master violinist Leonid Kogan. Kagan who died in 1990 at the age of only 44 has a considerable following among connoisseurs. Amongst his most effective and eloquent advocates is Professor Maria E Michel-Beyerle. Her company, Live Classics, has created a Kagan Edition which draws on radio station and Melodiya sound materials. The Kagan Sibelius has considerable documentary value and must have been held in considerable affection by the Kagan family. A native of the extreme East of the USSR (the city of Sakhalin) his family moved to the other extreme, to Riga in Latvia in his early years and his outstanding musical skills took him to Moscow to study with Boris Kuznetsov and then with David Oistrakh. The Sibelius tape, sourced from Finnish Radio, enshrines the very performance that won him the 1965 Sibelius Competition. It reveals the nineteen year old Kagan as a player with slender tone, petulant attack and phrasing alive to variety and emphasis. The original tape and transfer engineering was accomplished with exemplary care. It is satisfying also to hear Hannikainen conducting the Finnish Radio orchestra. Kagan twenty years later had developed a much more refined and succulent tone. The Berg Concerto is given a wonderfully poised and moving performance. All credit to Hans Vonk for his direction of the Vienna Symphony. They handle the diaphanous orchestral textures with masterly sensitivity. I do not recall having been quite so moved by the calming susurration of those tolling opening bars. This strikes me as a very special performance. 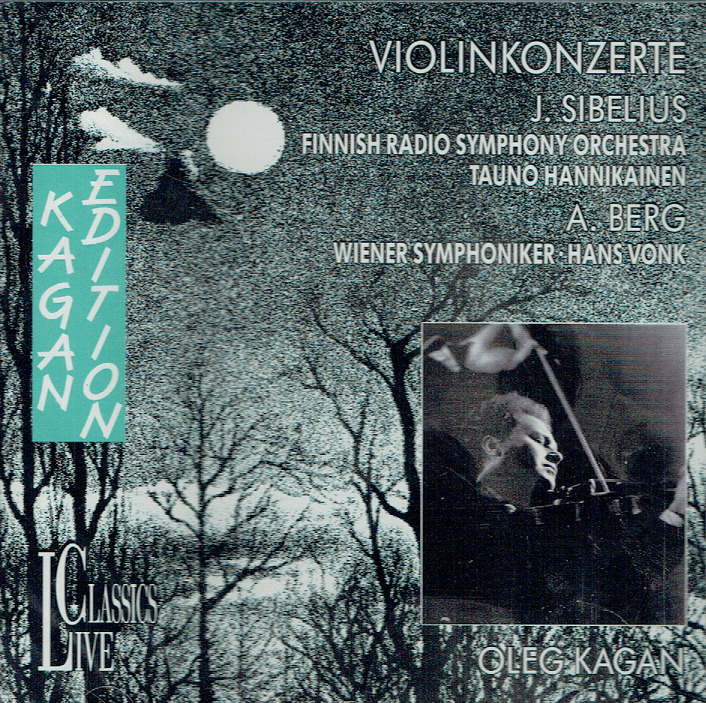 This disc is satisfying for the Sibelius and outstanding for the Berg." “Oleg Kagan was one of the foremost Russian violinists from the latter half of the twentieth century. While he developed a reputation on his own, many know him for his collaborations with pianist Sviatoslav Richter, as well as for his chamber music activity with a clutch of Soviet artists that included his first wife pianist Elisabeth Leonskaja, second wife cellist Natalia Gutman, pianist Elisso Virssaladze, and violist Yuri Bashmet. Virtuoso violinist David Oistrakh was an ardent admirer of his pupil Kagan, arranging for him to record all of Mozart's concertos while serving as his conductor in the enterprise. Though Kagan played much Russian music, including works by Shostakovich and Schnittke, he focused heavily, at least in the recording studio, on the Germanic sphere: Mozart, Beethoven, Schubert, Mendelssohn, and Brahms. Many of his numerous recordings were reissued on the German label Live Classics, EMI, and Olympia. Kagan was born in the Eastern Soviet city of Sakhalin on November 22, 1946. His father was a physician with a passion for music. Young Oleg grew up in Riga (Latvia), studying first with Joachim Braun at the local conservatory, then with Boris Kuznetsov, who would eventually take him to Moscow for study. 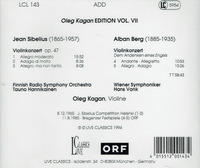 Kagan won first prize at the 1965 Sibelius Competition and second prize at the 1969 Tchaikovsky. After Kuznetsov's death Kagan immediately began studies with David Oistrakh and soon found himself in a circle of friends that included Sviatoslav Richter, with whom he would collaborate in numerous concerts. Between 1975 and 1983 they gave a series of acclaimed Mozart sonata recitals, many recorded and later issued. Throughout the 1970s and '80s Kagan's reputation grew as he extended his repertory to include Messiaen (Quartet for the End of Time), Ravel (Duo Sonata for Violin and Cello), contemporary Soviet composer Sofia Gubaidulina (Rejoice! ), and works from the Second Viennese School.